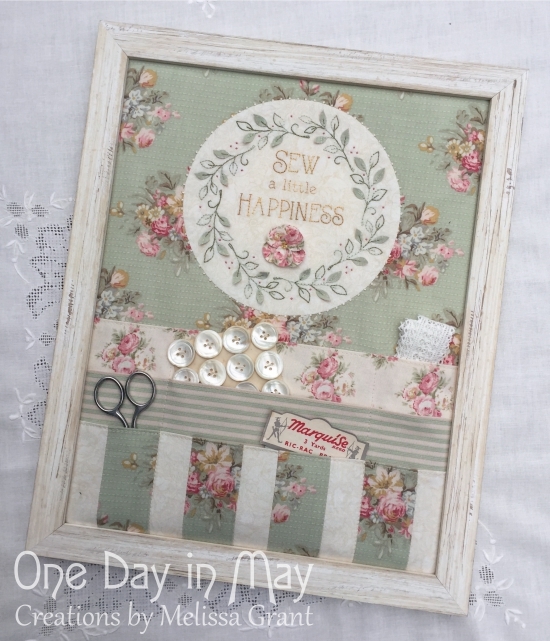 Sew Tidy pattern release and a giveaway! This week I’m sharing my latest design and having a “6 PATTERN GIVEAWAY”…. 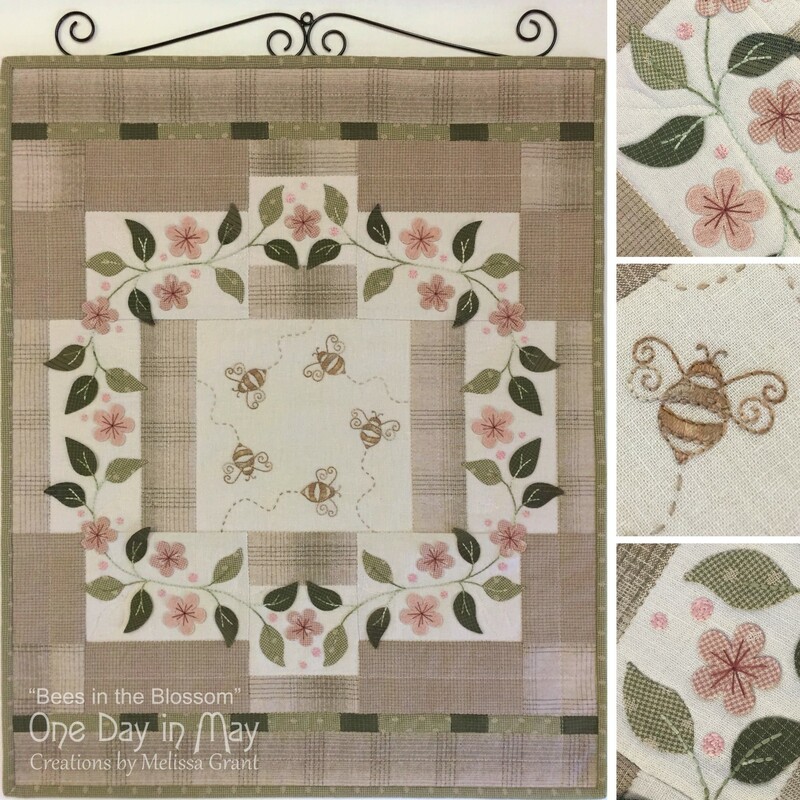 one each of the latest One Day in May pattern releases. 3 new Christmas designs, a wall hanging, a table topper and a framed piece which offers an extra storage option for your sewing space. Details can be found at the end of this post. I love a practical project, don’t you? Earlier this year, I was invited to design a project for the Tilda Club. I had my choice of Tilda fabrics to work with. So exciting! So many choices! When designing recently, I’ve tried to set myself a brief. There are so many project possibilities whirling around between my ears, sometimes it can be difficult to settle on an idea. So, my self-imposed design brief for the Tilda Club was… design a project that’s relatively small and achievable, that uses just a few fabrics, that combines several techniques, that is original, decorative AND practical. A brief is helpful (sort of). The file of ideas in my head can be sifted through. Any projects that don’t tick the boxes can be put aside. Logically, I should be left with a handful of ideas to choose from. Simple (in theory)! The problem is that while you efficiently “sift”, NEW ideas pop up… out of nowhere! Lots of them!! And that’s not simplifying the process at all is it? I’ve never been known for a talent in decision making. So with best laid plans of efficiency, organised thought and decisive design… I ended up running with a new “out of the blue idea”, which just by coincidence happened to somehow fit my self-imposed brief. Hmmm… is there method in my creativity? Or creativity in my method? Whatever it is, it’s a happy outcome. Tilda Club Members received this pattern in July. Earlier this month, I was able to release it as the latest addition to my pattern range. Sized to suit an 11″ x 14″ frame. At the base there are 3 large divided pockets for storing lots of your sewing essentials… notions needed for your current project, rotary cutter, scissors, tape-measure, pattern pieces and more. Stand the finished piece on your sewing table or hang it on a wall, to keep your tools and notions visible and close at hand. If you’re anything like me, there is always a hunt involved when embroidery scissors are needed. “Sew Tidy” uses just 4 fabrics, one of which is a simple off-white print. I chose 2 floral prints and a coordinating stripe for my 3 feature fabrics. The wreath panel combines embroidery with semi-detached applique leaves and a dimensional fabric flower. The leaves and flower are made with double-sided fabric and are only partly stitched down, allowing them to sit up from the background fabric. This gives the design some extra texture and dimension. There are lots of photos in my instructions… and the method is much easier than you’d expect. The panel is appliqued to the background fabric and edged with ecru French Knots… I love how they transform a plain edge into something soft and pretty. “Sew Tidy” is now available through your local patchwork store. 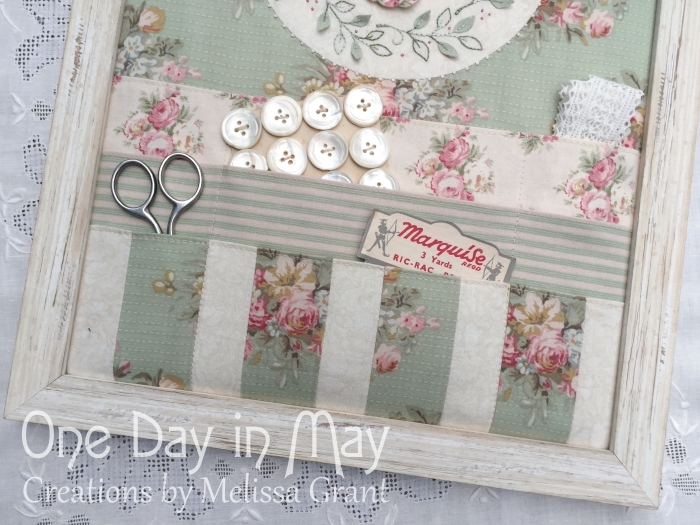 Stores that stock One Day in May patterns can be found on my Stockists page. You can also find “Sew Tidy” HERE along with more photos. So, it occurred to me this week, that it’s been ages since I’ve had a GIVEAWAY! In fact I’ve released 6 new patterns since. I’ve had such wonderful encouragement and support since launching this site and beginning my “new adventure“… and I really think that’s worth celebrating. I have one of each new pattern to giveaway this week! Click on the photos to find more images and details of each design. To enter, simply leave a comment telling me which pattern you’d like to create or give as a gift. Entries close at 11pm, December 4th, 2015 (AEST). Six winners will be randomly chosen and announced a day or two after that. Both national and international entries are welcome… good luck! Would love to make 6 or so Merry Doves to give as a gift to my ‘Special’ people. It is so adorable. I love them all… but most of it is the Bee quilt …. I would love A Merry Dove Candle wrap as I love Xmas decorating and I just bought Spring Blush Table Topper so no need for it. The dove pattern is exciting! Something different to create will fit right in at Xmas!! I would like to make the Redwork Christmas Wreath, the dimensional holly leaves look great. I just bought your notions keep pattern and started the stitching. I just love your unique style, the designs caught my eye immediately. Just lovely. The Festive Star, would be my fist project to make. They are all gorgeous Melissa but I think my favourite would be the Christmas Wreath, closely followed by the Sew Tidy Tools and Notions Keep. Thanks for the lovely giveaway. I would love to do the sew tidy. Your designs are all so beautiful, but if I had to pick one, it would be the sewing notions keeper. I so love the Dove Candle Wrap, it is so sweet. How lovely, hugging the candles at Christmas. Thank you for the giveaway. I would love your redwork wreath. I am decorating my new house and it would fit right in, as a wall hanging. My kitchen is red and white. 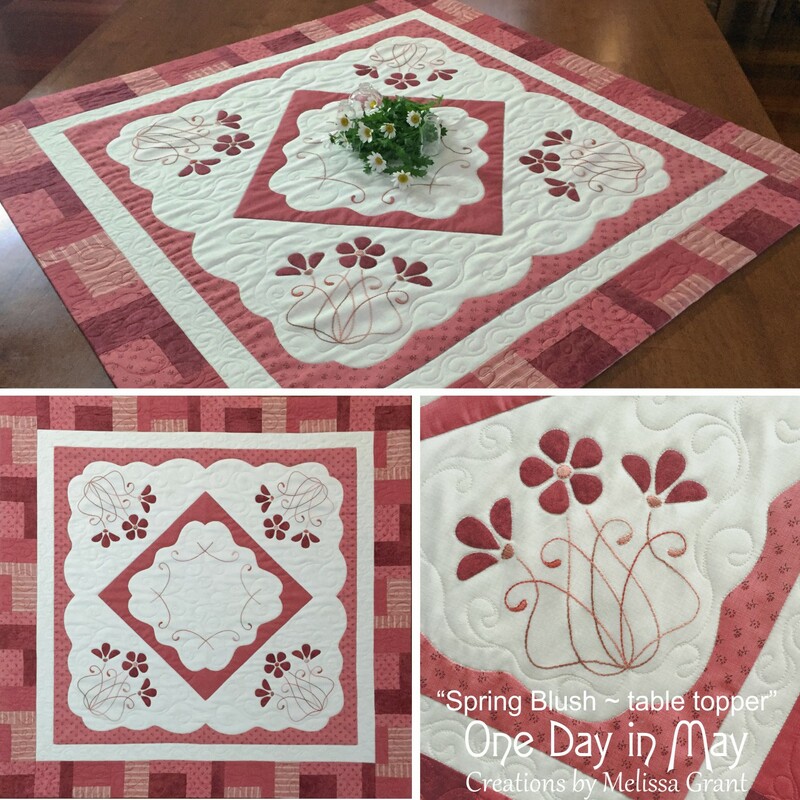 I would love to win the spring blush table topper. I would do it in the same colour way as my Hannah’s garden wall hanging to match. Love your designs. O how hard it is to choose! Your patterns are all exquisite and I guess I have to choose the Merry Dove. Truly, they are all so beautiful. Thank you for the giveaway. Have a few of your patterns Melissa, all are lovely, would love the festive star , I love all things christmas, my christmas table runner now is one I made when I first started quilting, about time for an upgrade!! I would the the Red Work Wreath. I would guve this to one of my work colleagues as she is a true aussie battler. Thank you for this opportunity. I love all your lovely patterns and would like to win the Blush table topper. I’ve been waiting for the Sew Tidy pattern to be released. I fell in love with it at your stitching day with Lisa. I can’t wait to make it. Thanks for such lovely designs Melissa! My favourite is the Festive Star, I’d love to make it for the family Christmas table. I love them all, but my favorite is the Redwork Christmas Wreath, it reminds me of a time when Christmas was simpler, when it was all about family, friends, fun and the Christmas spirit. Seeing the wreath will teach me to stop and enjoy the event, rather than stress about the day. Thank you for this opportunity. Such lovely designs, but my favourite is the Redwork Christmas Wreath…would love to try those leaves too. It would make s gorgeous addition to any home at Christmas. Oh my goodness how does one decide when they are all so terrific but I really love “The Festive Star” and “The Merry Dove”…… decisions decisions ummmm….. The Merry Dove has my vote and I have just the person to make one for. 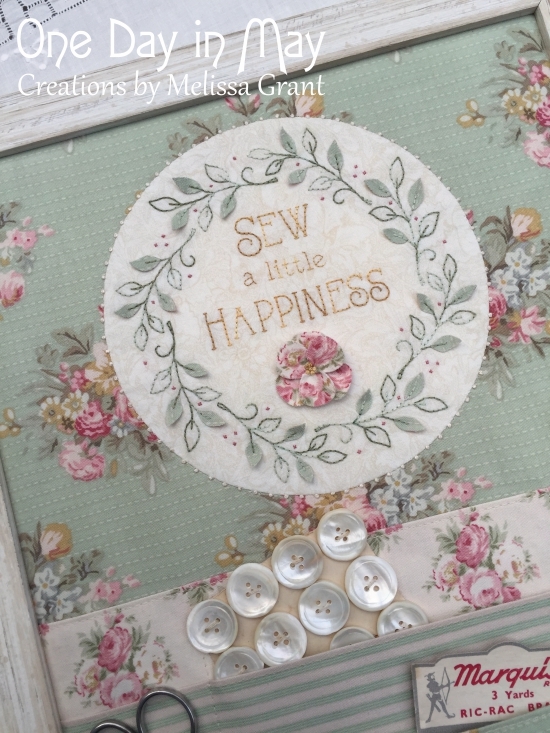 I am really enjoying making your Sew tidy tools and notion keep at the moment and would love my next project to the Merry Dove just love it. Thanks for this opportunity. I would love the sew tidy, it would make a beautiful present for my Kris Kringle! It is so hard to choose which design there are so many I like, each year I make a Christmas decoration for each of my grown children, I would love the Dove candle/jar holder it would look fabulous on their Christmas tables. Thank you for this opportunity to win one of your amazing designs. 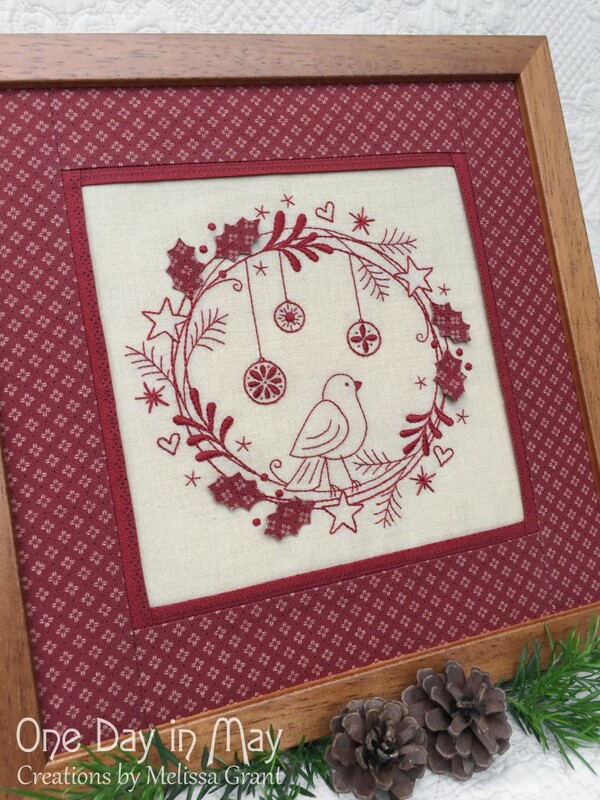 I really love doing embroidery so would just love to win the Christmas Redwork Design. It’s adorable! As I give lots of home made produce the dove and candle wrap would be wonderful to dress up a special gift. Love your designs Melussa. Have all but two of these patterns and would really love Spring Blush to make as a thank you gift for friends who we recently stayed with in Adelaide. It would look great on their coffee table in their lounge room. All beautiful patterns … would love to make some “Merry Doves”. “Bees in the Blossom” is simply beautiful (although I also love all of your other patterns). This reminds me of one of my favorite times of the year – spring. Many THANKS for this giveaway Melissa. 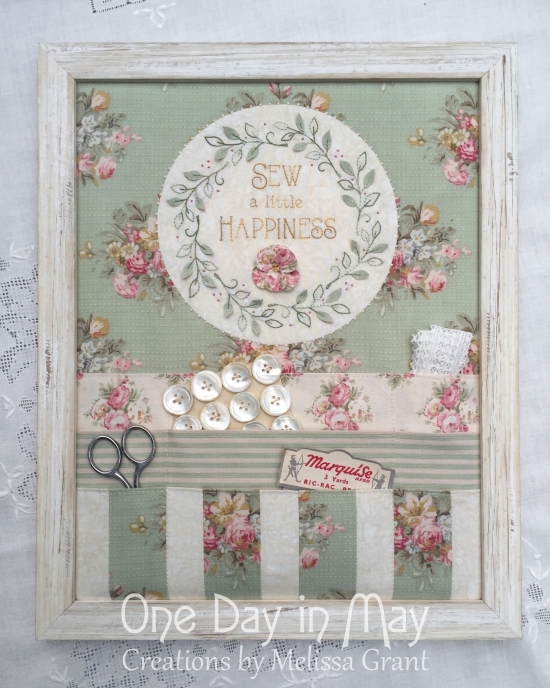 I would love the ‘Sew Tidy’…..a wonderful piece to stitch and gift to a special stitching buddy. I’ve already purchased the Merry Dove to wrap around jars of goodies for the children’s teacher at Christmas. Oh My too hard to choose but since I have to I’d choose the sew tidy and I wouldn’t stop at one as I could see me making one for my sister as well 🙂 Barb. I just love the Christmas Redwork wreath. I already have almost all of you beautiful patterns. I love the red work Christmas wreath, it’s gorgeous. Thanks for the give away. I love all of the patterns but the one I would be thrilled to win is the candle wrap, I would make myself one,both of my daughters and probably a few more as gifts. This is such a fun give away thank you. I love them all but would love to sew the festive star. Thank you. The Redwork Christmas Wreath. I love doing Redwork embroidery. It is gorgeous, I’d Love to make it for a special sister-in-law who is in Scotland. Thanks for your generous offer. Love the Redwork Christmas Wreath. I just love the redwork Christmas pattern. Gorgeous. mjulie measomeasom@bigpshould be Julie Measom. I love your patterns and hand piecing and embroidery. I would love to own all of them but if I have to choose one my choice will be Redwork Christmas Wreath as something I will stitch for just for me. I would like either the embroidered mat or the Christmas wreath. I know a few people who would love your designs but I think I may just make them for myself. Just love the dove candle wrap – adorable, and so suitable for our ‘un-wintery’ Christmas celebrations. I love the framed wreath, love doing stitcheries, all lovely. I’d love the Dove Candle Wrap – I think it would be lovely to receive or make as a gift 🙂 Gorgeous patterns as always. Its so hard to choose, they’re all so beautiful, but I do absolutely love the Sew Tidy ~ Tools and Notions Keep. I would make one for my mum who lives in a caravan and is strapped for space but I know loves her sewing and knitting. They are all lovely, I would be very pleased to win any, but I do like the Merry Dove Candle holder which I could put on my table with the Festival Star Doily or Spring Blush Table runner. Hope to hear from you soon. I would love to make a Redwork Xmas Wreath. Absolutely stunning. I love them all but would make the sew tidy for my mother and the red work Christmas wreath for myself. Just love the all red concept. I’m about to make a Merry Dove but am king of smitteny over the Christmas Wreath & Christmas Star too but the table topper really has me wanting! They are all gorgeous patterns – I’ve had my eye on the Christmas Wreath for a while… thanks for the chance! Wow how amazing they all look, love them all but Spring Blush table topper stands out today. Great work. 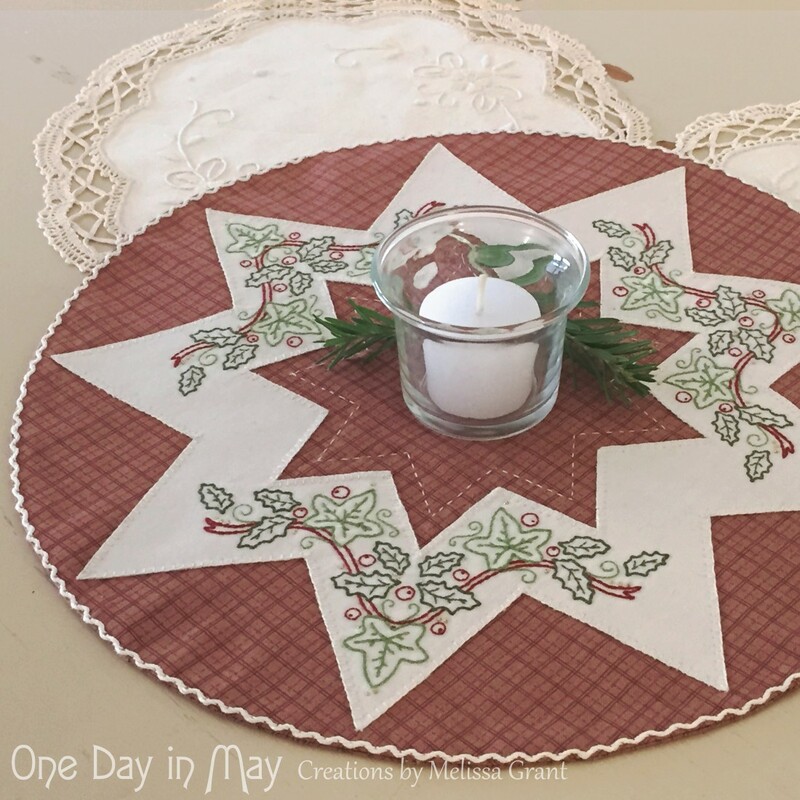 Love them all, the table yopper would be fantastic in my new home, the Christmas doily a must have, been looking for a candle mat pattern, but I adore the dove, so unusual, would be a great Kris Kringle gift. Thanks for your inspiration and gorgeous patterns. I just love the candle wrap, what a lovely gift idea. I would like to make the tidy tools and notions for my future daughter-in-law for Christmas , as she has asked me to teach her to sew and she really loves your beautiful designs. They are all beautiful but if I have to pick just one it will be the Redwork Christmas Wreath. They are all so beautifully created it would be very hard to choose. I would dearly love the opportunity to make the sew tidy for my very special friend. I had to have Bees in the Blossom when I first saw it so I already have that one. Now my next favourite is a toss up between the Redwork Christmas Wreath and the Sew a Little Happiness tool tidy. They are both sew cute! The Sew Tidy is eyecatching and versatile and a great asset to make and keep. Or maybe for gifts. Or both. Thank you for your generosity, and talent. I would choose the Sew Tidy Tools. I would love any of them but at the moment the table runner ….. they are all so lovely. Oh my goodness, having to decide which one is soooooo hard but if I really have to it would be the Bees in the blossom. Congratulations on such a glorious array of designs you are very talented. Thanks for the opportunity to go in the draw. These are very pretty. Would be happy with anyone. Hi, I love the Pattern A Merry Dove – jar or candle wrap, it is so cute, it would make a gorgeous xmas present . I also love A Festive Star – Embroidered Doily it will make a lovely xmas present for someones table. Love them all. Redwork Christmas Wreath is my fav. they are all beautiful. Would love to add redwork christmas wreath to my ever increasing Christmas quilt! Sew tidy tools and notions keep looks like a fun project to make. I would love to recieve and make then gift to table topper and the a Merry Dove Candle/jar holder. You are very clever to designs these for us to recreate. i would love to make the spring blush table topper I have the perfect table for it , just love your patterns and have finished a couple in the last few months . Melissa your designs are beautiful, have meaning and are practical. The stand out for me is the Redwork Christmas Wreath. Absolutely Stunning, a gift! I would love to make the Christmas wreath as I have just decorated and it would look great with the other decorations. It’s so hard to choose a favourite but I am really taken by the dove and would love to make some as gifts for my sewing friends . All beautiful designs Melissa but I think my favourite is the star table centre – very elegant. I love all your designs, too hard to decide. Seeing them at the AQC was a delight. Would really love the table centre. Would just finish off the present table! I would love the Merry Dove coz I enjoy fiddling with things a bit different. Hi I love them all. But the merry dove would be nice as I would make it for my family. To remember my parents on Christmas Day. Hi Melissa you have such beautiful and unique designs. I would love to make the Festive Star. Thank you and Merry Christmas. Wow all of these new patterns are just stunning. After a long hard thought I would choose the “A merry dove jar or candle wrap”. This would be the perfect centrepiece that would also be a small part of me at xmas for each of my daughters. Oh Melissa, I absolutely love the Redwork Christmas Wreath! The way you have combined 3D applique with stitchery is so creative. I would be keeping this finished project for myself, it would be impossible to part with. The Merry Dove is gorgeous. The Merry Dove is very special … We all need peace in our lives and what a beautiful way of spreading a little to our friends and family at this time of year. Hi Sarah, (hoping I can contact you through replying to your comment, as I tried emailing you last week… worried my email may have been sent to a spam folder). Guess What! Your name was drawn and you are the winner of the “A Merry Dove” pattern. 🙂 Could you please email me at info@onedayinmy.com.au with your postal address, and I’ll pop it in the mail for you. My favourite is the dove followed closely by the red work. Love your latest projects Melissa, especially the wall hanging. It’s so beautiful, and practical too. I absolutely love the Redwork Christmas Wreath. I would make it for a special stitching friend and then one for myself! I loved the star festivo embroiderie!